Scholars believe the translation of Monte Sano was lost at sea but theorize that it is German for "a whale's mountain". And for those who haven't seen the movie Anchorman, that's obviously not true; but what is true and most locals can tell you is that Monte Sano is Spanish for "mountain of health" due to its unspoiled air and clean mineral springs. In 1887, the 233-room Hotel Monte Sano health resort opened. It promptly closed in 1900 (sad trombone). The most frequented trails in Huntsville are all located on Monte Sano such as Mountain Mist, McKay Hollow, and the North Plateau and South Plateau Loops. The Von Braun Astronomical Society also operates a planetarium on the mountain near the State Park campground. 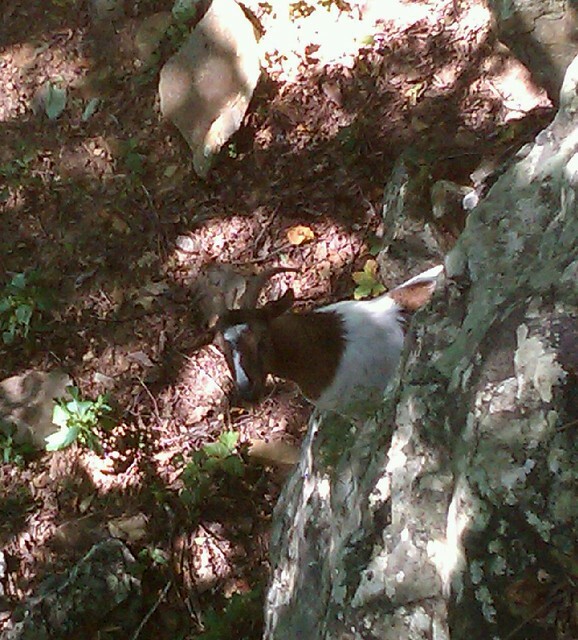 No respectable description of Monte Sano would be complete without at least mentioning the feral goats. Plus, goats are so du jour right now. Often dismissed as an urban legend, hikers frequently report wild goat sightings. Hiking the northeast slope of the mountain near "Golan Heights" will give you the best opportunity of glimpsing the herd. We've received several "confirmations" of the goats but have no photographic evidence to provide other than this image posted to Flickr that claims to have been taken on Monte Sano. Apparently they were domesticated at some point before either escaping or being abandoned. Round Top is really just the southwestern knub, or plateau, of Monte Sano. It's where the Burritt Museum, Burritt Cross and Rock Bluff Trail are located. Huntsville Mountain - 1,562 ft. Heading south, Round Top sort of branches off into either Huntsville Mountain due south or Garth Mountain southwest. I'll start with the line of mountains due south, therefore Huntsville Mountain which has been left largely undisturbed save one major development. The area of highest elevation was lopped off to make way for The Ledges golf course and subdivision built in 2000. Green Mountain - ~1,450 ft.
Green Mountain runs parallel and east to Bailey Cove Road. The northern section of Green Mountain contains Blevins Gap Nature Preserve and the popular Certain Trail with beautiful views of the Bailey Cove area. Blevins Gap is simply the "gap" between Huntsville Mountain to the north and Green Mountain to the south. Green Mountain is also home to Sky Lake and the Madison County Nature Trail. And at the southern end is the new Buzzard Falls Trail built by residents of the Oak Bluff subdivision. Wallace Mountain - 1,342 ft. Continuing south, Green Mountain becomes Wallace Mountain which is surrounded by Hobbs Island Road on the southern side. There's a proposed greenway planned to connect the Madison County Nature Trail to the Flint River via Wallace Mountain. Drake Mountain - 1,444 ft. Yes, there are apparently two Drake Mountains in Huntsville. This one is just east of Huntsville Mountain in Big Cove. Little Mountain - 945 ft.
Due east of Blevins Gap in Big Cove and home to the Little Mountain subdivision. Garth Mountain - 1,004 ft.
Garth Mountain is covered with neighborhoods. Think Whitesburg Drive and Drake Avenue area. Randolph High School is located on Garth. At the intersection of Whitesburg and Airport, which is the southern edge of Garth Mountain, most Huntsvillians have experienced the steep hill while crossing Whitesburg heading toward Jones Valley or going the opposite direction and having to lock up your brakes to stop at the traffic light. The Whitesburg Drive-In was also near this intersection until it was burned down in 1980. Morris Mountain - 784 ft. It's times like this when I wish I knew exactly where South Huntsville turned into South South Huntsville but I think it's right around Morris Mountain. Morris is the small hill sandwiched between Lily Flagg and Weatherly east of Memorial Parkway. Full of single family homes, there is almost no green space on Morris Mountain. Moving south from Morris Mountain, Weatherly and Mathis Mountains are right in the middle of south Huntsville neighborhoods. There is plenty of undeveloped land but it appears to belong to a handful of homeowners with spacious backyards. Out 72 East in Gurley, Keel Mountain is best known for the appropriately named Keel Mountain Preserve maintained by The Nature Conservancy based near DC. The Preserve is home to the "Lost Sink" waterfall, as well as, an endangered flower which is exclusive to our local mountains. A Google search also shows a firearm and munitions company of the same name resides atop Keel Mountain. Finally, there's the legend of lost gold buried somewhere on Keel Mountain. The story goes that a Union shipment carrying $50,000 in gold currency was ambushed by Confederate soldiers however, the valuable contents of the shipment were unknown to the attackers. At the first sign of trouble, a Union soldier moved the bags of gold to his horse and took off in a separate direction while the main forces were preoccupied. However, a single Confederate soldier chased him down and shot him. After seeing the sacks of gold and overcome with greed, the Confederate soldier simply buried the bags, intending to return after the war, and rejoined his comrades. Some months later, the soldier took a slug to the stomach in battle. On his death bed, he incoherently shared his secret but some parts of the story were not understood including the location of the buried gold.